According to police, both guns had been modified. 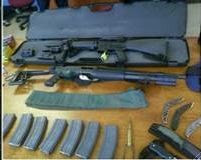 Huizinga told police he bought the guns to celebrate his 18th birthday. His mother describes him as a “sportsman and gun enthusiast” and said that he just wanted to show off his new guns to his friends in Maine. God help a mother who gives her blessing for her son to buy himself a mini-arsenal, complete with bullet-proof vest, for his 18th birthday. He may never “have been in trouble of any kind before” but he’s certainly heading down a dangerous road. And the sad part is, he purchased all these guns legally.